Discussion in 'General Discussion' started by Mick West, Jun 5, 2014. 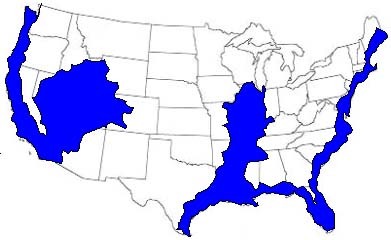 (Leaked US Navy Map) This is what the continent of the USA will look like once the New Madrid Fault line is hit with a massive HAARP frequency impulse in the nearing future. Get informed and get ready. PS: Make sure to save, and get this out to as many people as possible, as they have tried censoring this photo in the past removing it from google images, and removing commentated youtube videos regarding it etc. I was very fortunate to have come across it again. The old man then gave him a map that would aid in finding places of safety as these changes start to occur. Gordon-Michael Scallion has received updates and further visions since this initial meeting with this apparition. This all climaxed on June 10th when he told Art Bell that these changes would begin in earnest the between the last few weeks of JULY AND THE END OF SEPTEMBER, this year. He is predicting that the results of a pole shift of the earth’s magnetic field (that he contends began in the mid-1930s) will trigger violent hurricanes, earthquakes, and volcanoes as the plasma from the earth’s core is upset by the magnetic reversal. He is particularly concerned about quakes in Manhattan, Long Island, and Connecticut in the range of 4.0-5.0. He also sees the entire West Coast becoming very stressed from these initial disturbances. He predicts the entire state of California will become the "Islands of California", with a new coastline as far inland as the Great Salt Lake. The map is entirely counter to possible geographical changes, requiring the submerging of 4,000 to 10,000 feet high ground in Nevada, while 100 feet high areas of Florida are untouched. The "great salt lake" (by Salt Lake City) is 4,000 feet above sea level. But aside from the map being vastly inaccurate, the problem here is this is a prediction for a sea level rise in 2012, and not some plan for an Earthquake in the future. The map is being shown around on Facebook, and various blogs, like this one by "Zen Gardener"
Where the image is shown, along with the simplified version, except this time Gardener claims it's from the Navy. Again, this map is nothing official. It's just another version of Scallions maps dating back to 1979, illustrating predictions that he made for the 1990s, which never happened. So we've moved from Lex Luthor doing that to California and most of the West Coast, to the Mississippi? Oh....the "Expanding Earth" (so-called) 'theory'??? Difficult to know where to begin to debunk that....however, this is not the thread for such an effort. 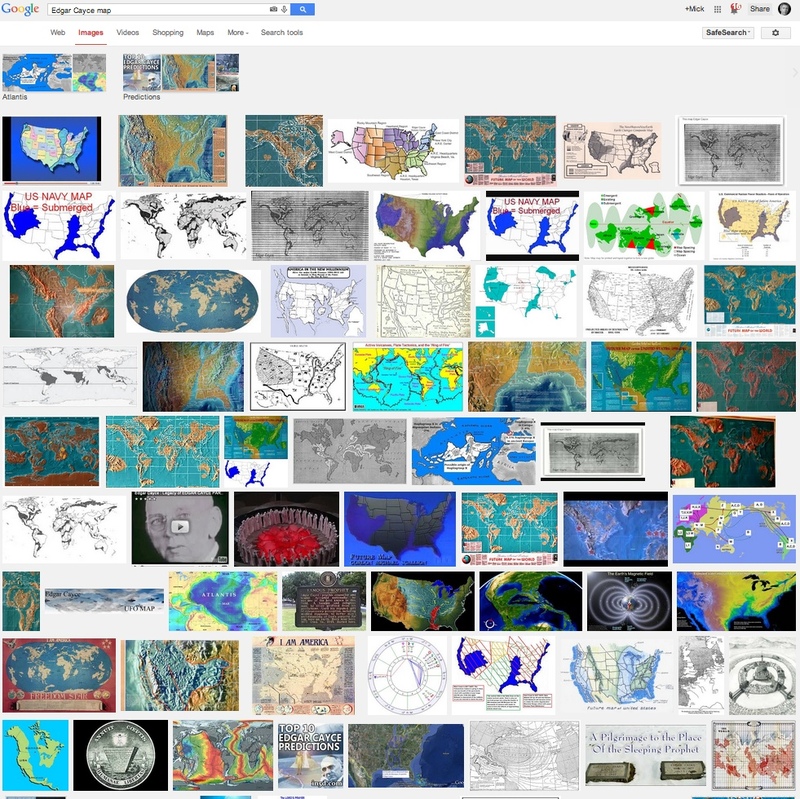 That map looks similar to ones associated with Edgar cayce. I love it when pretend scientist borrow from so called psychics. Not that strange from a geologist's perspective. 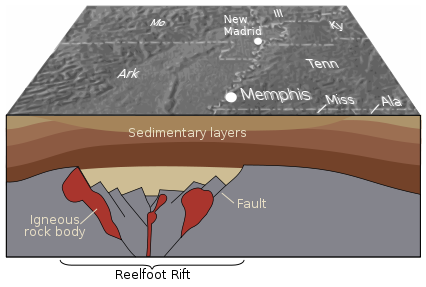 The New Madrid rift and Northern Nevada rift have been trying to open for a long time. 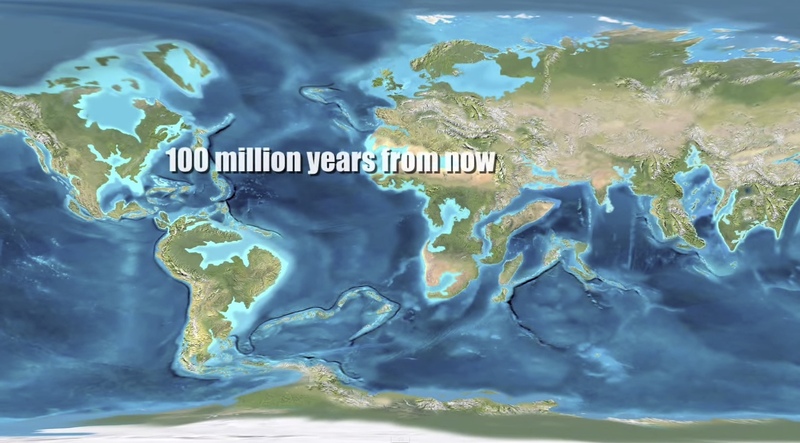 Not going to happen next year, but the maps are realistic 100k+ years down the road. Big continental shields like north America are giant insulators that eventually have to break somewhere due to heat flow from the mantle. Just the same as the great rift valley in Africa. Sorry to unbunk the debunk but these predictions are realistic, but only in geologic time. Yeah, but that's in 100 million years. And, even those visual representations (a 100 million years hence) did not take into account the tectonic movements of the continents, and the changing relationships that that entails. It is commonplace for Humans to have difficulty wrapping their minds around times scales that far exceed the typical human lifespan, not to mention geological (and cosmological) time spans. Even if his map was completely accurate, the bunk is more in the mechanism by which it happens than the result. A hundred million years of inexorable continental drift is a lot different than a cataclysm of pole shifts, hurricanes, earthquakes, and volcanoes, and plasma from the Earth's core. ....and plasma from the Earth's core. Is THAT part of the fear, too?? If so....well, it must be a very small fraction of CTs, because any serious understanding of science dispels this immediately. Yes, that level of dramatic change is going to require basically several months of magnitude 12.0 earthquakes, destroying all the large life on the planet. Anyway. The main point I was debunking is that it's not a Navy map. The ridiculousness of the map in it's original context is just an illustrative detail. Are you politely suggesting a large fraction of CTs have a serious understanding of science? I think you'll find that 99.9% of the population, CT or not, would be able to answer the question "is there plasma in the Earth's core". Gosh darn, I missed a "not" there. Is there any plasma at the Earth's core? Maybe just a little? What's your pre-internet answer? As a schoolkid I learned about the hot center core of our planet....mostly molten iron (with other elements mixed in, because it's not homogenous). The principle, as it was explained, is simple....gravity pulls most things that are heavier down. This is a simplistic explanation, since of course we observe variances in nature....but, overall, this is the concept of gravity, and then depth and pressure (deep inside a planet) and the resulting forces OF gravity that act....along with the friction, and resulting heat, of OTHER forces that can act upon a planet due to outside gravitational influences. NOW....this is ALL theoretical, I grant....but there are thousands upon thousands of very learned experts who devote their lives and intellectual careers to these sorts of studies, so I always bow to their knowledge, and attempt to learn from them. Apologies in advance....I am a huge fan of "WildwoodClaire1" on YT, so forgive my promotion here of her videos. Except for the inner bit (760 mile radius), which appears to be solid. The inner structure of the Earth was fascinating to me as a kid. I doubt it was a common interest though. 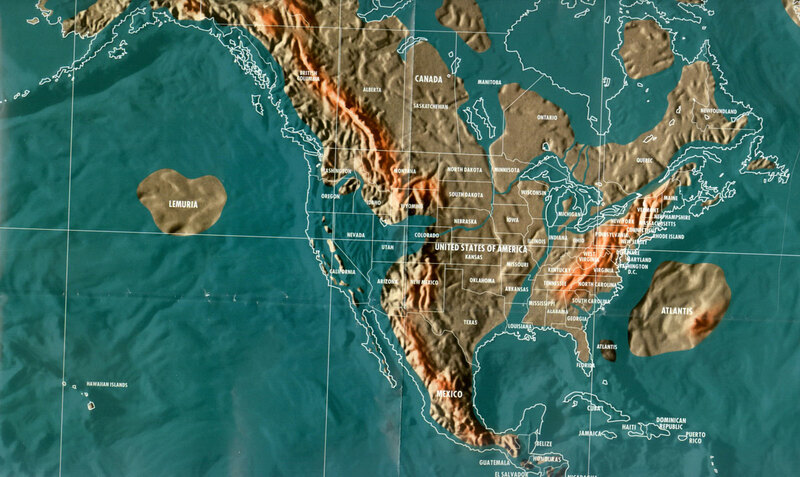 My point is that the map that started this thread is actually geologically realistic if the two documented rifts in North America actuality became active. When and if they become active is a matter of geologic debate, there are a lot of failed rifts in the geologic record. 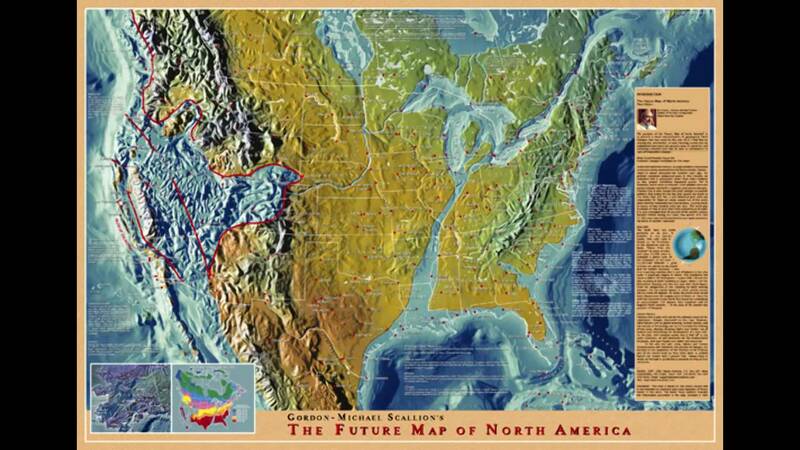 The Northern Nevada rift is dead for now but the mid-continent/New Madrid rift has been active in historical times. But realistically we are talking about geologic time scales. I have to disagree with Mick by about two orders of magnitude, a million years could create the rifting needed to produce what is shown in the map. Not like it really matters to us as the continental changes will be so slow as to be imperceptible. THIS is why the science of the internal structure of "rocky" planets, such as the one we live on, is so fascinating. It (this science) also involves studying OTHER "rocky" planets (examples in our Solar System are Mercury, Venus and Mars) in order to get a further grasp of the theoretical concepts. Sidebar: not to seem condescending, but many use the word "theory" in the English language vernacular to mean "guess". It is not. a. A scheme or system of ideas or statements held as an explanation or account of a group of facts or phenomena; a hypothesis that has been confirmed or established by observation or experiment, and is propounded or accepted as accounting for the known facts; a statement of what are held to be the general laws, principles, or causes of something known or observed. I agree, in terms of the "accepted usage" of the word theory. I just wish that MORE people could be educated to realize that "hypothesis" is not equal to "theory". Because, an actual "theory" in the pure scientific sense is NOT a "conjecture", nor a "hypothesis"....it is an amalgam of solid, eventual and repeatable FACTS that...all point toward the conclusion that (admittedly) is postulated by a particular theory....even IF said theory is not (yet) fully defined. By "fully defined", anyone who understands the concept knows that in MOST science, there are usually some "open-ended" questions....but when an aspect of science is repeatable, even if not "fully" explained, then there is no doubt as to its veracity. HAVE NOT YET FULLY EXPLAINED IT, to everyone's satisfaction. My theory is that it actually is equal, in the common tongue, so complaining about it is just a distraction. Where is the claim that the first map you show was made by the US Navy? It'd be good to find the first instance of it, bit hard as the idea seems to have been around for a while and constantly repeated. 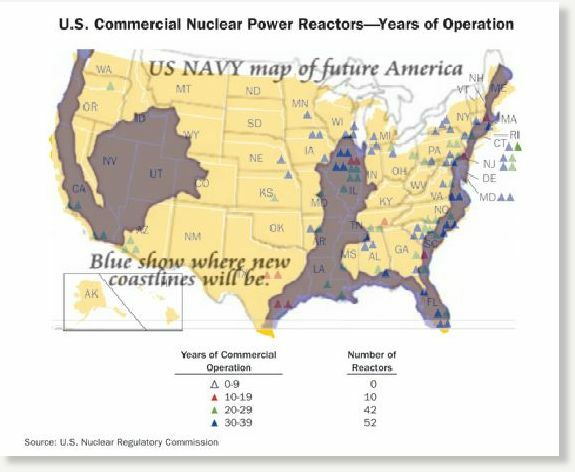 Found this interesting post on Snopes forum referring to this map. In 2009, I took part in a multinational simulation exercise with US, British, Australian and New Zealand forces in the US. Because of varying political sensitivities, the area of operations for the simulated theatre was chosen as the mountains and plains of the central US. This region here was developed enough in infrastructure to present a realistic area within which we had to work. However, the exercise was not just a land forces exercise. It was a joint exercise, meaning maritime forces, air forces and land forces were working together. There was no way that maritime forces could actively participate if the main amount of activity was taking place along the Utah/Arizona border, so a vast sea was superimposed on our maps taking over most of Nevada. This allowed the various navies to fully participate. The other 'sea', to the east, was used as a strategic marker. Coalition forces controlled the 'western sea' while the 'eastern sea' was under control of other forces. At that time, all the nations participating were engaged with their capability development teams, meaning the people partaking in the exercise were the people responsible for the design of the land, maritime and air forces for their respective nations in the 2020s and beyond. I was with the Canadian delegation and our force date was aimed at 2021. So, to make the exercise work for all the nations, the exercise date was set at 2028. 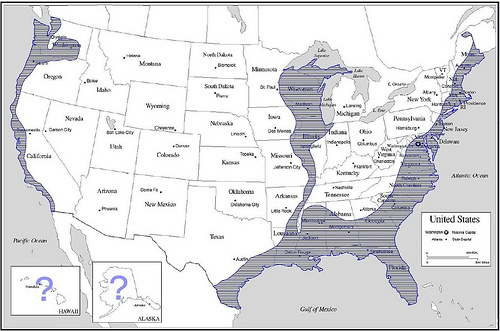 The general lay of the land was that there were four or five countries in the area we know as the US. The failed state we were working in consisted primarily of Utah and Kansas. Friendly nations were north and west of that (west of the sea in California and Oregon and north of the AO meaning Montana, the Dakotas and Nebraska). The enemy country was basically everything south of the Arizona, New Mexico, Oklahoma and Arkansas northern state lines. East of the eastern sea was another nation that was friendly to the enemy nation. In order to make the geography work somewhat, Baja California was wiped off the face of the earth, as well as a chunk of southern California. Why the map shows the western and eastern coasts under water really is beyond me. The beauty of creating this exercise was that all the underpinning geographic, population and military data was already in hand. This made a multi-layered, complex environment that was much better than the bog standard simulation event and much less expensive to create. Obviously, there would have to be a few changes. For example, I was in Hite, Utah (real life population of 8, and a few mountain goats). However, to make the scenarios work, it was a port town with mining and smuggling along the border as its main economic engines. Population was expanded to 50 000 people. A bit phony on the map, but it was OK.
One of the follies was that Hite is in the middle of the mountains. on the 2D map, it looked like Norway with the fjords and the mountains dropping off into the sea etc. However, because I was working many jobs, including airspace deconfliction, I worked in 3D. I would do a scan of the airspace from Hite and see mountains of water towering over me to the west. The modifications of the map only went as far as drawing a 2D map; the underlying 3D data remained. Because of varying international restrictions on the use of military information, regardless of its sensitivity, we Canadians were forbidden from bringing any information on exercise development out. We could bring results from our own experiences, but nothing about the exercise per se. What a shock to see the map (minus the east and west coasts) pop up here. I love Claire, she is the take no bs grandma I wish I had. You know, less Arkansas might not be a bad thing, especially if the bit that's left has beaches. Hell, I might even go back for a visit - and that's something I'd never have predicted after my first and only pass through that cultural wasteland. Still, it did make Texas look very good indeed. One thing often overlooked with tectonic movement and/or sudden catastrophic disaster (like the unlikely one hyperboled in the OP) is ocean currents. We don't need continents smashing into each other to change them and changing them can spell doom (or be a welcome change, who knows) for life on Earth. How far does North America need to move towards Asia before the currents change? Probably sooner than 100 million years. 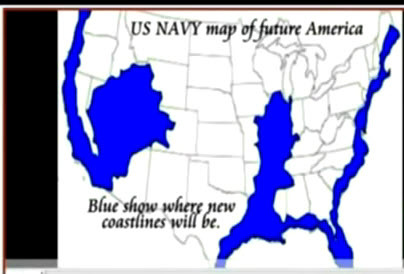 If California did suddenly fall into the ocean tomorrow then that could change the currents as well. If it does fall into the Ocean tomorrow, I'm moving to Arizona Bay and start giving swimming lessons! My reference is to a Tool song called AEnema. They got the idea from comedian Bill Hicks. Posting a Tool video deserves the winner medal. EDIT: Sorry, the music does not appeal to me, and the images in the first few minutes are very disturbing....BUT, I do know who Bill Hicks was!! (That's something...at least...). Anyone not disturbed by Tool videos, is probably disturbed. This map was also circulated by idahopicker last year. He seems to have sort of vanished. He fled on a druck driving charge in addition to child support.